Read the two epigraphs printed at the front of the book. How do you think each relates to Lia and her situation? What do the crossed-out words and phrases reveal about Lia? Why can’t she allow herself to say or think some things? What is she afraid will happen if she does? 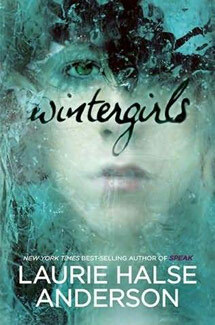 Define “wintergirl.” In what ways are Lia and Cassie frozen? Discuss the symbolism of winter and cold found throughout the story and the role it plays in building the main themes of the novel. Does Lia want to lose weight so she will look thin and pretty? What does her thinness mean to her? How does she think it gives her power? Does Cassie’s death trigger Lia’s restrictive eating patterns to reemerge? Why or why not? “Empty” becomes synonymous with “strong” for Lia throughout most of the story. How does Lia justify this comparison? Do her feelings ever change? Lia repeats the phrase “When I was a real girl . . .” If she’s not real now, what is she? When did she stop being real? Will she ever be real again? The night Cassie dies, whey does she call Lia? Would it have made a difference if Lia had answered? Why or why not? Could anything have saved Cassie? In the newspaper article about Cassie’s death, the superintendent of schools says, “Most teens today struggle with something.” Do you agree? Explain your opinion. What is friendship? Describe the important elements of Lia and Cassie’s relationship. Are they really friends? Describe Lia’s relationships with her mother, father, Jennifer, and Emma. How is Lia different with each of them? What do they each contribute to her situation? How do they each influence her? Lia is particular about the names she calls her family members (i.e. “Jennifer” instead of Stepmother, “Dr. Marrigan” instead of Mom, “Professor Overbrook” instead of Dad). What does this reveal about what Lia thinks of her family members? Discuss they line: “I pretend to be a fat, healthy teenager. They pretend to be my parents.” What does this line expose about Lia’s feelings for her parents? What does Lia’s frequent use of the word “pretend” throughout the book tell you about the way she views others? Why does Lia feel she and others must pretend? What does Lia think makes her strong? What do you think of as Lia’s strengths? Would Lia agree with you? How does Lia’s perception of strength change toward the end of the story? What do we learn from Cassie’s ghost? Does her presence help or hinder Lia on her path to recovery? What does Cassie’s ghost come to symbolize by the end of the novel? Discuss Lia’s relationship with Elijah. When she first meets him and lies about her identity, why do you think she chooses to give her stepsister’s name as her own? What is Elijah able to give Lia that the other people in her life cannot? What do you think about the way their relationship ends? What role does Lia’s knitting play in the novel? What does it come to symbolize? Elijah calls himself “a wanderer in search of truth.” Does he find truth by the end of the story? Does Lia? Are any of the other characters able to do so? Explain. Lia’s mother tells her: “Cassie had everything: a family who loved her, friends, activities. Her mother wants to know why she threw it all away.” According to Lia, asking “why” Cassie died is the wrong question. She says to ask “why not.” What do you think she means by this? Which do you think is the right question to ask? Is there an answer to either? Why do you think Lia and Cassie took their eighth grade New Year’s resolutions so seriously? How do these promises play into the rest of the story? Lia’s dad says to her: “I wish I understood what goes on inside you . . . why you’re so afraid.” Is fear part of Lia’s problem? What is she afraid of? What is Lia using her thinness to communicate to her parents? What is her body saying that her voice cannot? Why do you think Lia finally opens up to Dr. Parker? What do you think of what she chooses to tell her? How does the conversation change Lia’s situation? Dr. Parker tells Lia: “In one aspect, yes, I believe in ghosts, but we create them.” Do you agree with her? How much of what happens to Lia is a result of her own doing? How much of it is caused by others? What does the “see-glass” mean to Lia? What does she think she needs it for? Does this end up being true? What ultimately changes for Lia by the end of the story? Why does she survive when Cassis didn’t?